Draft: 1995, San Francisco Giants, 4th rd. April 18, 2010 Los Angeles Dodgers designated RHP Russ Ortiz for assignment. April 5, 2010 Los Angeles Dodgers selected the contract of RHP Russ Ortiz from Albuquerque Isotopes. April 4, 2010 Russ Ortiz assigned to Albuquerque Isotopes. January 17, 2010 Los Angeles Dodgers signed free agent RHP Russ Ortiz to a minor league contract and invited him to spring training. September 4, 2009 Colorado Springs Sky Sox released RHP Russ Ortiz. August 23, 2009 Colorado Springs Sky Sox signed free agent RHP Russ Ortiz. August 17, 2009 Scranton/Wilkes-Barre Yankees released RHP Russ Ortiz. August 6, 2009 New York Yankees signed free agent RHP Russ Ortiz to a minor league contract. August 6, 2009 RHP Russ Ortiz assigned to Scranton/Wilkes-Barre Yankees. 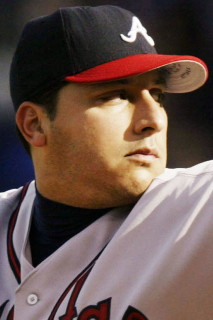 July 30, 2009 Houston Astros released RHP Russ Ortiz.